"Katydid" redirects here. For other uses, see Katydid (disambiguation). 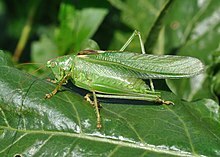 Insects in the family Tettigoniidae are commonly called katydids (in Australia, South Africa, the United States), or bush crickets (in the British Isles). They have previously been known as long-horned grasshoppers. More than 6,400 species are known. 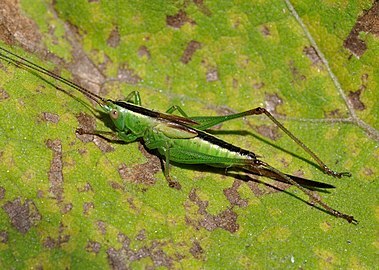 Part of the suborder Ensifera, the Tettigoniidae are the only extant (living) family in the superfamily Tettigonioidea. They are primarily nocturnal in habit with strident mating calls. 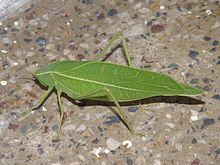 Many katydids exhibit mimicry and camouflage, commonly with shapes and colors similar to leaves. The family name Tettigoniidae is derived from the genus Tettigonia, first described by Carl Linnaeus in 1758. In Latin tettigonia means leafhopper; it is from the Greek tettigonion, the diminutive of the imitative (onomatopoeic) τέττιξ, tettix, cicada. All of these names such as tettix with repeated sounds are onomatopoeic, imitating the stridulation of these insects. The common name katydid is also onomatopoeic and comes from the particularly loud, three-pulsed song, ka-ty-did, of the nominate subspecies of the North American Pterophylla camellifolia, often called the common true katydid. Tettigoniids range in size from as small as 5 mm (0.20 in) to as large as 130 mm (5.1 in). The smaller species typically live in drier or more stressful habitats which may lead to their small size. The small size is associated with greater agility, faster development, and lower nutritional needs. Tettigoniids are tree-living insects that are most commonly heard at night during summer and early fall. Tettigoniids may be distinguished from the grasshopper by the length of their filamentous antennae, which may exceed their own body length, while grasshoppers' antennae are always relatively short and thickened. The lifespan of a katydid is about a year, with full adulthood usually developing very late. Females most typically lay their eggs at the end of summer beneath the soil or in plant stem holes. 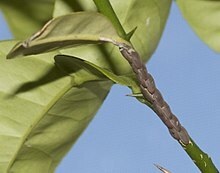 The eggs are typically oval and laid in rows on the host plant. The way their ovipositor is formed relates to its function where it lays eggs. The ovipositor is an organ used by insects for laying eggs. It consists of up to three pairs of appendages formed to transmit the egg, to make a place for it, and place it properly. Tettigoniids have either sickle-shaped ovipositors which typically lay eggs in dead or living plant matter, or uniform long ovipositors which lay eggs in grass stems. When tettigoniids hatch, the nymphs often look like smaller versions of the adults, but in some species, the nymphs look nothing at all like the adult and rather mimic other species such as spiders and assassin bugs, or flowers, to prevent predation. The nymphs remain in a mimic state only until they are large enough to escape predation. Once they complete their last molt, they are then prepared to mate. Tettigoniids are found on every continent except Antarctica. 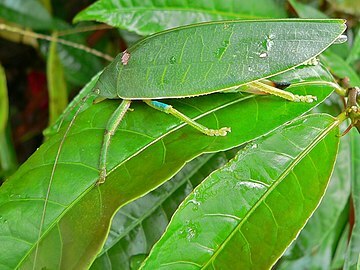 The vast majority of katydid species live in the tropical regions of the world. For example, the Amazon basin rain forest is home to over 2000 species of katydids. However, katydids are found in the cool, dry temperate regions, as well, with about 255 species in North America. The Copiphorinae were previously considered a subfamily, but are now placed as tribe Copiphorini in the subfamily Conocephalinae. The genus Acridoxena is now placed in the tribe Acridoxenini of the Mecopodinae (previously its own subfamily, Acridoxeninae). The genus Triassophyllum is extinct and may be placed in the Archaeorthoptera. 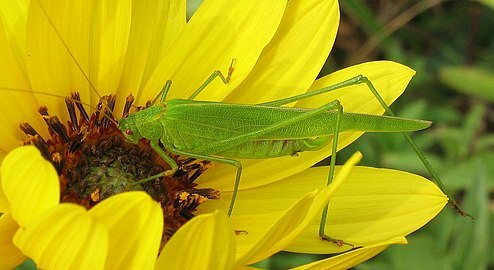 The diet of most tettigoniids includes leaves, flowers, bark, and seeds, but many species are exclusively predatory, feeding on other insects, snails, or even small vertebrates such as snakes and lizards. Some are also considered pests by commercial crop growers and are sprayed to limit growth, but population densities are usually low, so a large economic impact is rare. Tettigoniids are serious insect pests of karuka (Pandanus julianettii). The species Segestes gracilis and Segestidea montana eat the leaves and can sometimes kill trees. Growers will stuff leaves and grass in between the leaves of the crown to keep insects out. By observing the head and mouthparts, where differences can be seen in relation to function, it is possible to determine what type of food the tettigoniids consume. Large tettigoniids can inflict a painful bite or pinch if handled, but seldom break the skin. 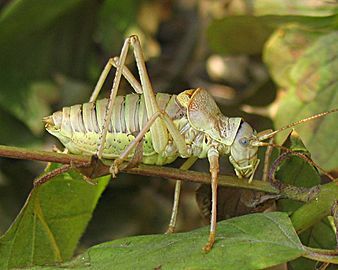 Some species of bush crickets are consumed by people, such as the nsenene (Ruspolia baileyi) in Uganda and neighbouring areas. The males of tettigoniids have sound-producing organs located on the hind angles of their front wings. In some species, females are also capable of stridulation. Females chirp in response to the shrill of the males. The males use this sound for courtship, which occurs late in the summer. The sound is produced by rubbing two parts of their bodies together, called stridulation. One is the file or comb that has tough ridges; the other is the plectrum is used to produce the vibration. For tettigoniids, the fore wings are used to sing. Tettigoniids produce continuous songs known as trills. The size of the insect, the spacing of the ridges, and the width of the scraper all influence what sound is made. Many katydids stridulate at a tempo which is governed by ambient temperature, so that the number of chirps in a defined period of time can produce a fairly accurate temperature reading. For American katydids, the formula is generally given as the number of chirps in 15 seconds plus 37 to give the temperature in degrees Fahrenheit. Some tettigoniids have spines on different parts of their bodies that work in different ways. The Listroscelinae have limb spines on the ventral surfaces of their bodies. This works in a way to confine their prey to make a temporary cage above their mouthparts. The spines are articulated and comparatively flexible, but relatively blunt. Due to this, they are used to cage and not penetrate the prey's body. Spines on the tibiae and the femora are usually more sharp and nonarticulated. They are designed more for penetration or help in the defensive mechanism they might have. This usually works with their diurnal roosting posture to maximize defense and prevent predators from going for their head. When tettigoniids go to rest during the day, they enter a diurnal roosting posture to maximize its cryptic qualities. This position fools predators into thinking the katydid is either dead or just a leaf on the plant. Various tettigoniids have bright coloration and black apical spots on the inner surfaces of the tegmina, and brightly colored hind wings. By flicking their wings open when disturbed, they use the coloration to fool predators into thinking the spots are eyes. This, in combination with their coloration mimicking leaves, allows them to blend in with their surroundings, but also makes predators unsure which side is the front and which side is the back. The males provide a nuptial gift for the females in the form of a spermatophylax, a body attached to the males' spermatophore and consumed by the female, to distract her from eating the male's spermatophore and thereby increase his paternity. The Tettigoniidae have polygamous relationships. The first male to mate is guaranteed an extremely high confidence of paternity when a second male couples at the termination of female sexual refractoriness. These investment functions are a parental paternity. The nutrients that the offspring ultimately receive will increase their fitness. The second male to mate with the female at the termination of her refractory period is usually cuckolded. The polygamous relationships of the Tettigoniidae lead to high levels of male-male competition. Male competition is caused by the decreased availability of males able to supply nutritious spermaphylanges to the females. Females produce more eggs on a high-quality diet; thus, the female looks for healthier males with a more nutritious spermatophylax. Females use the sound created by the male to judge his fitness. The louder and more fluent the trill, the higher the fitness of the male. Oftentimes in species which produce larger food gifts, the female seeks out the males to copulate. This, however, is a cost to females as they risk predation while searching for males. Also, a cost-benefit tradeoff exists in the size of the spermatophore which the male tettigoniids produce. When males possess a large spermatophore, they benefit by being more highly selected for by females, but they are only able to mate one to two times during their lifetimes. Inversely, male Tettigoniidae with smaller spermatophores have the benefit of being able to mate two to three times per night, but have lower chances of being selected by females. Even in times of nutritional stress, male Tettigoniidae continue to invest nutrients within their spermatophores. In some species, the cost of creating the spermatophore is low, but even in those which it is not low, it is still not beneficial to reduce the quality of the spermatophore, as it would lead to lower reproductive selection and success. This low reproductive success is attributed to some Tettigoniidae species in which the spermatophylax that the female receives as a food gift from the male during copulation increases the reproductive output of the reproduction attempt. However, in other cases, the female receives few, if any, benefits. The reproductive behavior of bush crickets has been studied in great depth. Studies found that the tuberous bush cricket (Platycleis affinis) has the largest testes in proportion to body mass of any animal recorded. They account for 14% of the insect's body mass and are thought to enable a fast remating rate. ^ Ragge DR (1965). Grasshoppers, Crickets & Cockroaches of the British Isles. F Warne & Co, London. p. 299. ^ Ingrisch, Sigfrid; Rentz, D.C.F. (2009). "Chapter 187 - Orthoptera: Grasshoppers, Locusts, Katydids, Crickets". Encyclopedia Of Insects (Second Edition). pp. 732–743. doi:10.1016/B978-0-12-374144-8.00196-X. ISBN 9780123741448. ^ "Tettigoniidae". Merriam-Webster. Retrieved 31 March 2015. ^ "Tettix". Merriam-Webster. Retrieved 31 March 2015. ^ Harper, Douglas. "katydid". Online Etymology Dictionary. ^ "common true katydid (Pterophylla camellifolia)". Retrieved 12 August 2018. ^ Funk & Wagnalls New World Encyclopedia (1 ed.). EBSCO Publishing. p. 1. ^ a b Rentz, David (15 July 2010). "A guide to the katydids of Australia". Journal of Insect Conservation. 14 (6): 579–580. doi:10.1007/s10841-010-9312-4. ^ "Bush crickets". BBC Nature. Retrieved 25 November 2013. ^ "Tree of Life project". Retrieved 25 November 2013. ^ a b c French, Bruce R. (1982). Growing food in the Southern Highlands Province of Papua New Guinea (PDF). AFTSEMU (Agricultural Field Trials, Surveys, Evaluation and Monitoring Unit) of the World Bank funded project in the Southern Highlands of Papua New Guinea. pp. 64–71. Retrieved 20 September 2018. ^ Columbia Electronic Encyclopedia (6 ed.). p. 1. Retrieved 10 December 2014. ^ Robertson, Laura; Meyer, John (January 2010). "Exploring Sound with Insects". Science Scope. 33 (5): 12. Archived from the original on 4 May 2016. ^ Chapman, R. F. (2013). The Insects: Structure and function (5 ed.). Cambridge University Press. ISBN 978-0521113892. ^ "Can you tell the temperature by listening to the chirping of a cricket?". U.S. Library of Congress. ^ Montealegre, Fernando; Morris, Glenn (24 December 2003). "The spiny devil katydids, Panacanthus Walker (Orthoptera: Tettigoniidae): an evolutionary study of acoustic behaviour and morphological traits". Systematic Entomology. 29 (1): 29–57. doi:10.1111/j.1365-3113.2004.00223.x. ^ Castner, James; Nickle, David (August 2004). "Notes on the biology and ecology of the leaf-mimicking katydid Typophyllum bolivari Vignon (Orthoptera: Tettigoniidae: Pseudophyllinae: Pterochrozini)". Journal of Orthoptera Research. 4: 105–109. ^ Vahed, Karim (1998). "The function of nuptial feeding in insects: A review of empirical studies". Biological Reviews. 73 (1): 43–78. doi:10.1111/j.1469-185X.1997.tb00025.x. ^ Gwynne, G.T. (December 1988). "Courtship feeding in katydids benefits the mating male's offspring". Behavioral Ecology and Sociobiology. 23 (6): 373–377. doi:10.1007/bf00303711. ^ Gwynne, Darryl T.; Brown, William D. (1994). 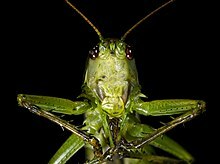 "Mate feeding, offspring investment, and sexual differences in katydids (Orthoptera: Tettigoniidae)". Behavioral Ecology. 5 (3): 267–272. doi:10.1093/beheco/5.3.267. ^ Jia, Zhiyun; Jiang, Zhigang; Sakaluk, Scott (2000). "Nutritional condition influences investment by male katydids in nuptial food gifts". Ecological Entomology. 25 (1): 115–118. doi:10.1046/j.1365-2311.2000.00239.x. ^ Vahed, K.; Parker, D. J.; Gilbert, J. D. J. (2010). "Larger testes are associated with a higher level of polyandry, but a smaller ejaculate volume, across bushcricket species (Tettigoniidae)". Biology Letters. 7 (2): 261–4. doi:10.1098/rsbl.2010.0840. PMC 3061181. PMID 21068028. Wikimedia Commons has media related to Tettigoniidae. "Katydid" . The American Cyclopædia. 1879. "Katydid" . Encyclopædia Britannica (11th ed.). 1911. "Katydid" . The New Student's Reference Work . 1914. This page was last edited on 4 April 2019, at 20:15 (UTC).